Settle in for Twitter Trivia, the online quiz game where I give you the questions, you give me the answers and I give you the Swag Bucks! Question 3: First 2 correct responders wins 100 Swag Bucks! Question 4: First correct responder wins 150 Swag Bucks! As a special bonus, if you win all four questions, we’re sweetening the pot with an extra 250 Swag Bucks! To play, head on over to Twitter. I’ll usually announce on Twitter and Facebook about 10 minutes prior that Trivia will be starting. So make sure you follow us on Twitter. Then, when I ask a question, you must reply to Swagbucks for your answer to be counted. 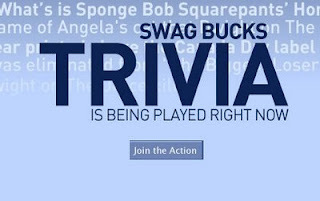 The easiest way to do this is to hit the curved arrow under the star on the Swagbucks tweet containing the question. This will start your tweet with “@Swagbucks“. After that text, answer the question with correct spelling and answer EVERY PART OF THE QUESTION. An important note: DO NOT DIRECT MESSAGE the answer. This clogs our inbox and prevents me from rewarding winners as swiftly as I should be. So, if you want less delay between questions, @ Reply to Swagbucks, do NOT Direct Message your answers. Trivia questions ALWAYS have multiple parts so giving one right answer out of the 3 questions asked in the tweet is a wrong answer. Answer ALL parts of the question. If you’re one of the first to answer correctly, TSG or TSGal will send a message to your Twitter inbox (or Direct Message you, AKA “DM”) giving you instructions on how to claim your Swag Bucks. Twitter Trivia begins at 3:30PM PDT today.